I know it seems early, and I always used to hate it when shops started bleating on about Christmas when summer was barely over, but as a retailer (of sorts! ), I now realise why they have to. Maybe not all of them…but some Christmas things need preparation. Every year we offer an Advent Calendar of Books: 24 individually wrapped books, one to open each day up to Christmas Eve. We tailor them to specific requests, and can do them for any age – last year we did one for a gentleman in his 80s and one for a baby who wasn’t born when his mother ordered the calendar, and most age groups in between! We charge £12 for children up to 12, £15 for 13-15 and £25 for 16 and over (adults), which reflects the differences in price we usually charge for the books. These are a bargain though! You can tell us the gender of your children, their reading ability, anything really, and within reason we will try to meet requests – each one is done to order. You can do a shared one, and we will wrap books for different ages in different paper so that each child knows which is theirs. For adults, we intend them to be fiction only, but we might be able to accommodate some non-fiction calendars, it just depends what we have in stock at any one time, as all our books are donated. We get loads of fiction and children’s books, so are confident about providing good things in those categories! Just email me for any more info or to place an order. They are lovely because they have real substance, you have the excitement of opening an actual gift each day, and there’s no temptation to rip the back off and steal all the chocolate! (Not that we had chocolate ones when I was growing up – the books bring back some of the magic, I think!) It’s something that builds excitement leading up to Christmas but in a way that helps to satisfy it too! A present every day – who doesn’t want that? But grown-ups also treat themselves, and while 24 novels might seem a lot, it will keep you going for a bit! Or you can share them with friends. In short, it is something intended to add to the magic of Christmas – which I adore! – and to give those you love lots of books with an element of surprise. We can post them out, though obviously P&P is extra – let me know if you’d like that, and I can let you know postage costs. For little children it’s not too bad, as the books are thin and light, but as they parcels get bulkier, the price of postage goes up. So – if you want an Advent calendar with a difference, one with real substance and magic, some extra fun at Christmas – do send me an email. You can collect at your convenience, and pay on collection, but the more time we have to get them ready, the better. And no more shall we part…with your help! The title is a Nick Cave reference, as some of you will recognise…if you don’t, no matter, find the song on youtube and prepare to have your heart broken. But the Tree House can help to heal broken hearts! (As can the music of Nick Cave, but that’s another story.) We’ve had a strange year – perhaps every year seems like a struggle, but this last 10-12 months has been particularly tricky. We always sail close to the edge, and it doesn’t take much to tip our finances into the danger zone. We had some setbacks in 2016 that have put us behind with our business rates and it’s been impossible to clear that backlog. But on a day to day basis, things are good. Book sales are pretty healthy, we now have three book groups that are thriving, our live music events tend to sell out (the money from those goes to the performers, so those don’t bring many funds to us, but as long as we’re breaking even, that’s all that really matters), though we have had to subsidise a couple of them, our open mic Tree House Sessions are lively and wonderful, our craft group is still going strong after three and a half years, and there is such a great core community at the bookshop, with people discovering us all the time. I feel we really do offer something a bit different to Kenilworth, something that embraces all sorts and ages of people, that promotes the arts at a time when we need their communal and healing powers more than ever. I struggle with my health, which means I often lack the energy to do as much at and with the bookshop as I would like, but there is a great team of people who help to keep it all going. Having decided – for health reasons as much as financial ones – that the strain was becoming too great, I decided I had to ask the landlord to find a new tenant for the premises, and that we would close. A few days after that decision, various things happened to make it seem possible that we could not only stay open but develop in new ways to make the business stronger. Our landlord at Berkeley House has been incredibly supportive, and so I made another decision – to launch an emergency fundraising campaign, as our backlog of rates and other expenses needs to be paid by the end of March to avoid further difficulty. The response has been phenomenal. We raised nearly £1000 on the first day, and in just a few days we have now raised around £1700. What this shows more than anything is the fantastic level of support there is, a huge desire to see the bookshop continue. We are not out of the woods yet, but if we can raise another £500 in the next two weeks, we will clear that backlog of debt and be able to continue. From 1 April, our business rates will be reduced by a very significant amount. Our wonderful landlords will sponsor us through their business. We are planning some things that will enhance the bookshop both as a physical space and as a business (still in very early stages, so no details yet! ), and we know now how strong the support is. I genuinely believe that with these changes, the business will be truly sustainable. If you would like to read about our fundraising campaign, click here – many of you have given in the past, and I don’t expect people to keep giving, but if you could share the campaign, that would be wonderful. It’s not just the people of Kenilworth and regulars at the bookshop who have raised the money so far – through social media, people far and wide have supported it. Every £1 helps, and some have given just that, others have given more. We’ve had the support of our very lovely patron, musician Warren Ellis, and his followers are now retweeting and responding to the campaign. Here’s a bit of Warren in action – his genius and energy and creativity inspire me every day. You can donate via the button below, if you feel so inclined, but this post is mostly about sharing what’s been happening and asking you to help us by spreading the word so that we can get the final few hundred pounds that we need before time runs out. You can, of course, just come and buy books or come to our events! We have local folk group Romany Pie playing on Friday 24 March, an open mic on Saturday 25 March, a very exciting gig with The Little Unsaid on Thursday 30 March, and I’ll be putting on films and lectures in the next couple of weeks too. But if you’re local and haven’t bought a book in a while, why not come and buy one – or two! – this week? Our paperback novels are less than the price of a cup of coffee in most cafés, they are more nourishing, and the enjoyment lasts a lot longer! They also make great accompaniments to a cup of coffee – today is a sunny spring day, what could be lovelier than sitting in a cafe with a book? It’s my day off, so I will be doing that in a while. Thank you to everyone who has supported us, in so many ways. Thank you to those who have already given to this campaign, and/or have spread the word already. If you’d like to see us not just survive but increase what we already offer, at a time when small independent high street businesses are closing or moving away, please consider getting us through this hurdle, and I know we can survive and grow if we can clear our debts. And come and see us soon! I normally find having to think about Christmas too early spoils some of the magic, and as a shopkeeper you have to start thinking about it much too early…I’m the sort of person who puts up their tree on Christmas Eve, and apart from an Advent calendar doesn’t want to think about it too much before then. But I am feeling festive early this year, thanks in part to our wonderful Christmas tree. I had seen photos of these on the internet and often thought I would like to have a go at making one, but when a friend offered to come and do it, I jumped at the chance – I’m not very practical when it comes to being creative, lots of ideas but no skills! So Clare came on Friday afternoon and built us a Christmas tree, helped by Will (who also played jazzed up versions of Christmas carols on the piano while Clare worked – it was fab!). Lights arrived the next day, and the whole thing looks amazing – lots of comments online and in the shop about how lovely it looks. 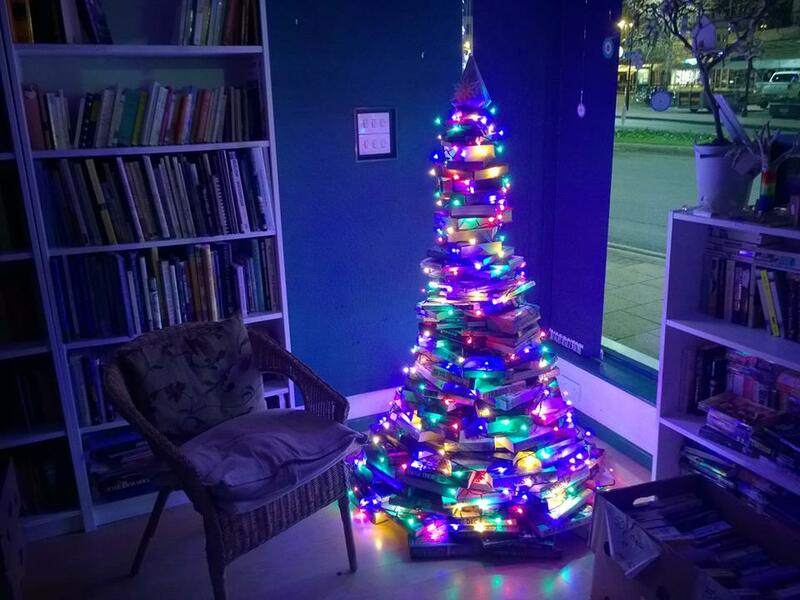 Last year we had a wonderful papier mache tree in the window, made from pages of worn out books, made by the excellent Vicki, and I was heartbroken that it accidentally got thrown out earlier in the year – I don’t think Vicki was too happy either! So it’s lovely to have another tree, also made by someone in the wider Tree House community, though I still miss Vicki’s – would have been amazing to have both! But that’s sort of the story of the Tree House – ups and downs, mistakes and triumphs, and through it all a wonderful group of people contributing in all sorts of ways. We have made it to the end of another year, always close to the edge financially, but with more support than I know how to respond to. Thank you Vicki, thank you Clare and Will, and thank you to whatever force in the universe keeps us going. I have a sneaky feeling it’s Warren Ellis, our patron, whom I plan to put on top of the tree…well, a picture of him, at least. I’ll write an annual review soon, but in the meantime here is one of my heroes and another of the bookshop’s household gods – the man awarded the Nobel Prize in Literature in 2016, and my favourite Christmas pop song of all (he didn’t write the lyrics to this). A lot can change in a week – this year has certainly shown us that. It’s no different here at the Tree House: a couple of weeks ago we found ourselves at a point where survival seemed impossible, but last week salvation came in the shape of the fabulous Astley Book Farm near Bedworth, the largest second-hand bookshop in the Midlands, and a popular haunt for some of our volunteers and regular customers. Owner Vivienne Mills (we even have the same initials!) appeared on the scene like some sort of angel and offered to take on the bookshop. It was too good an offer to refuse, especially as I will be able to carry on working here (three days a week) and will still be able to run our evening events. 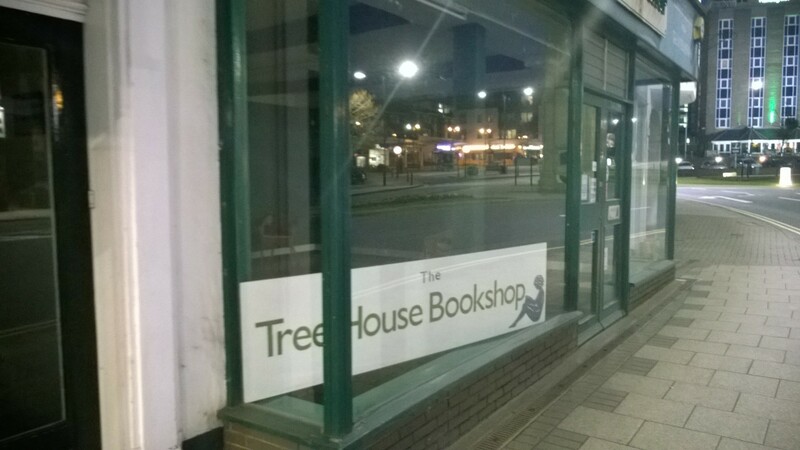 It means the Tree House will no longer be a Social Enterprise – in other words, it’s no longer a non-profit community venture, but will be run as a commercial second-hand bookshop. Vivienne has been running Astley Book Farm for 12 years and it is thriving, so we are in very good hands! It is a huge relief to know that the bookshop is now much more financially secure. Things are already changing in terms of the stock, and it will be an excellent second-hand bookshop – something in itself of real value to Kenilworth. The community side of things will continue via our evening events, and I will have more time and energy to focus on organising those. We are having a bit of a break at the moment, but I am putting together a new programme of music, lectures, films and literary events, and will publish those soon. For advance notice and earlybird tickets when available, you can subscribe to our mailing list (see the tab above for this). So there is still lots of potential for us to continue to bring people together through literature and the arts, and to bring live music and other wonderful things to the people of Kenilworth. This is all thanks to Vivienne and Astley Book Farm. Hurray! Book donations: We are no longer taking donations of books – we now buy books, so if you have books you are getting rid of, call in on a Tuesday or Thursday and have a chat with Vivienne, or bring them to her on those days. Tea/coffee: We have also stopped offering tea and coffee – this was always an informal arrangement, and while refreshments will still be available at evening events, it is not possible to carry on providing them during the day. It’s all very exciting, I hope you will continue to follow us in this new chapter and call in whenever you can. I have a lot of people to thank for getting us this far, but will do that in a separate post. What are you doing this Friday? 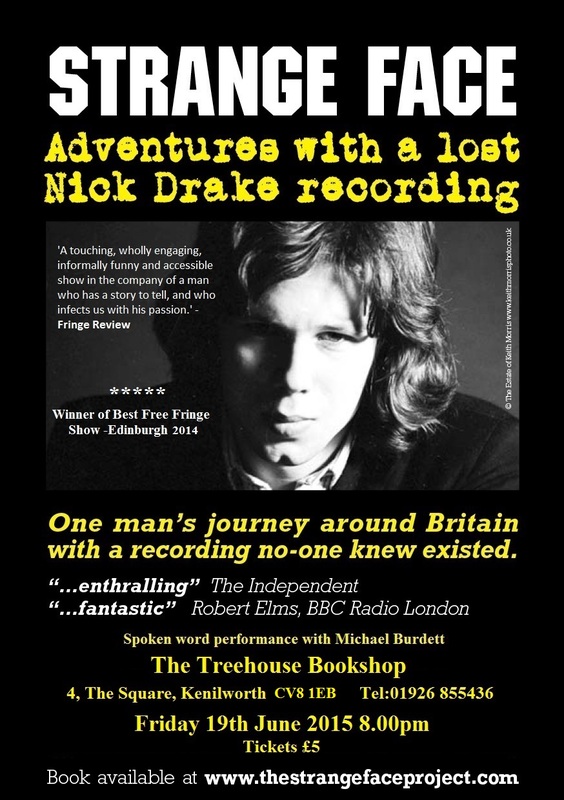 You are coming to the Tree House to listen to a truly fabulous illustrated talk about Nick Drake, of course! Why would you want to do anything else? Warwickshire has nurtured three of England’s greatest writers in different centuries – Shakespeare, George Eliot and Nick Drake (for me, the greatest British singer-songwriter of all). 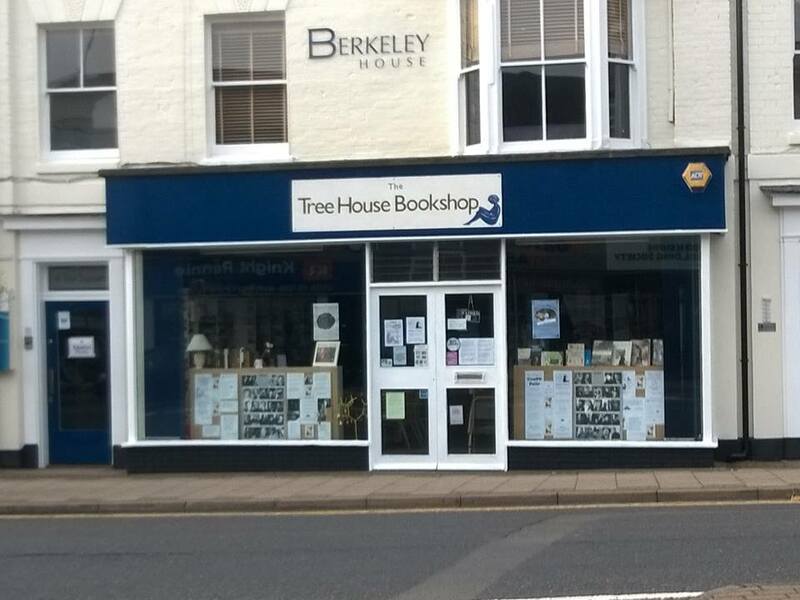 Before I opened the Tree House, when I was thinking of what to call our bookshop/community hub, I really wanted the name to be related to a Nick Drake song. I thought of Five Leaves, Pink Moon, Northern Sky, Fruit Tree, River Man…none of them seemed right, even though I knew it would be so cool to have a Nick Drake-related bookshop name. In the end I moved away from that idea and chose the Tree House for a number of reasons, but I still regret not naming it for him in some way. I love Nick Drake’s music – those exquisite songs and equally exquisite voice. He died before I even knew he existed, but he is in my top three popular musicians and I consider his record Five Leaves Left to be one of the all-time greatest records. So I was intrigued last year to see on Twitter some references to the Strange Face Project – about one man’s adventures with a lost Nick Drake recording – and started following the Twitter account. The project is about the finding of a tape with an unreleased Nick Drake song on it and the adventures relate to what the finder did with this. The man leading these adventures is the very lovely Michael Burdett, London-based musician and composer, and one day he phoned me to say he had seen my interest and wondered about coming to give his talk at the bookshop. He then turned up one day and we had an excellent chat, arranged a date, and he left – leaving some wonderful photographs behind. 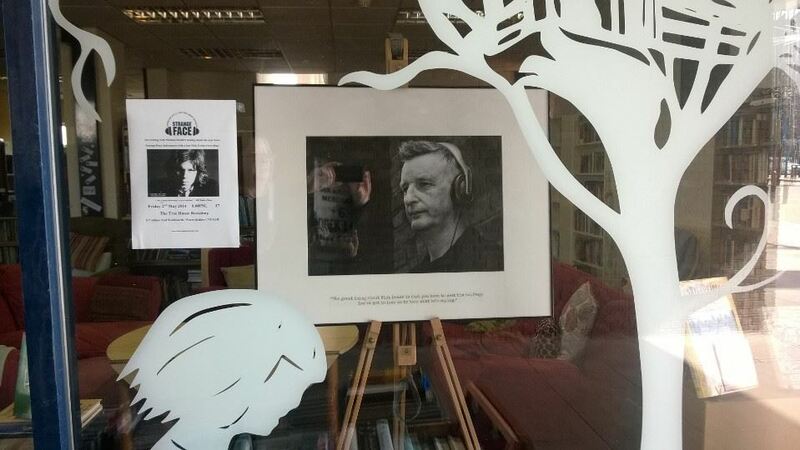 We used the one of Billy Bragg listening to the recording as our window display for quite a while. Michael came and gave his talk just over a year ago, and it was fabulous. It’s hard to convey quite why it’s so fabulous, especially without giving too much away, but ultimately it’s a story about the power of a piece of music – the impact it has on individuals and the way it connects people. The illustrated show was informative, funny, fascinating and very moving – the material is great, but Michael’s delivery is also fantastic. He is warm, funny, engaging, generous and passionate. He went on to take the show to the Edinburgh Fringe, where it (unsurprisingly) won the award for Best Free Show. He has also become a friend of the Tree House. He lives in London, but from time to time has appeared in the shop doorway bearing cake and good cheer. When we reopened I knew I wanted him to come back and give the talk again, and am thrilled that he agreed to do so, and he wants it to be a means of supporting the Tree House. He has revised and expanded the show, which he is taking to Edinburgh again this year, along with other festivals over the summer. But he is coming here first! This Friday, 19 June, 8pm. You’d be crazy to miss it. Tickets are £5, in advance or on the door, and included is a £2 voucher to spend in the shop. We would love a really good audience for this – it deserves to have the bookshop packed to the rafters. Please come, please bring your friends, please spread the word if you can’t come (or even if you can). You don’t have to be a Nick Drake fan to enjoy this event, though if you are it will make it all the more brilliant an evening. If you have friends who don’t know Nick’s music, bring them along – perfect opportunity to introduce them. There are only 40 tickets available, so contact us if you want to reserve some. More details in the poster below. Whatever you do and whyever you do it, just come along – it will be a truly lovely evening at a bargain price (you can give more if you want to! ), and you will be supporting the bookshop as well as having the best time. What more could you ask for on a Friday evening? Well, two days ago I signed the lease on the new premises and yesterday I picked up the keys – we’re in! 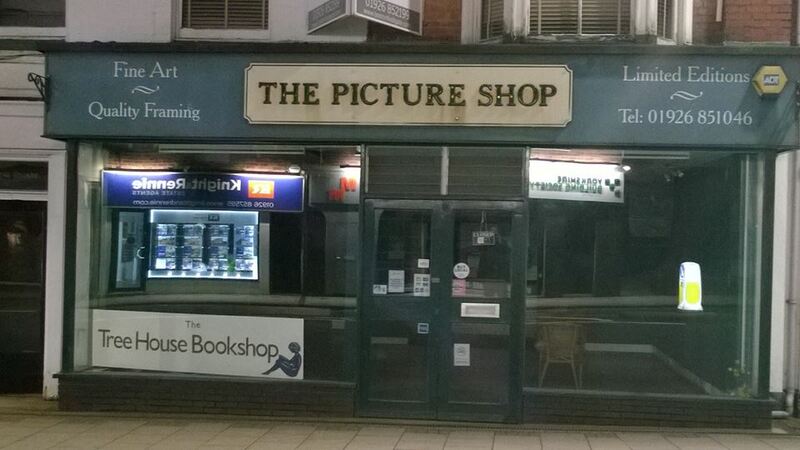 The Tree House will be taking over the former Picture Shop on Warwick Road, near the clock tower. Our lovely hand-painted sign from the old premises is now in the window to let people know – eventually it will be incorporated into the fascia sign above the window. So we will now retrieve our books from storage – thank you so much to Paul Seward at E-Warehousing for storing our books and the sign and some bits of furniture (and the tree!). We hope to be up and running very soon. A huge thank you to all the humblingly generous people who have contributed to our crowdfunding (which is still ongoing!) – you have made it possible for us to secure the lease and get started. The Round Table have also made a very large donation to help us get the fascia board changed and buy some of the furniture we need, including bookcases. If you walk past and see us in there, do call in and say hello! We hope to have the Film Club back up and running very soon and are already planning our next Mindfulness course. You can join our mailing list if you haven’t already to be kept up to date with events. Some fabulous musicians already planning to come and play for us! But mostly it’s about the books, and we will have those for sale as soon as we possibly can.